The California Earned Income Tax Credit (CalEITC) is a refundable state tax credit that helps people who earn little from their jobs to pay for basic necessities. The CalEITC builds on the proven success of the federal earned income tax credit (EITC), which reduces poverty and boosts employment, and may even improve children’s health and educational attainment. 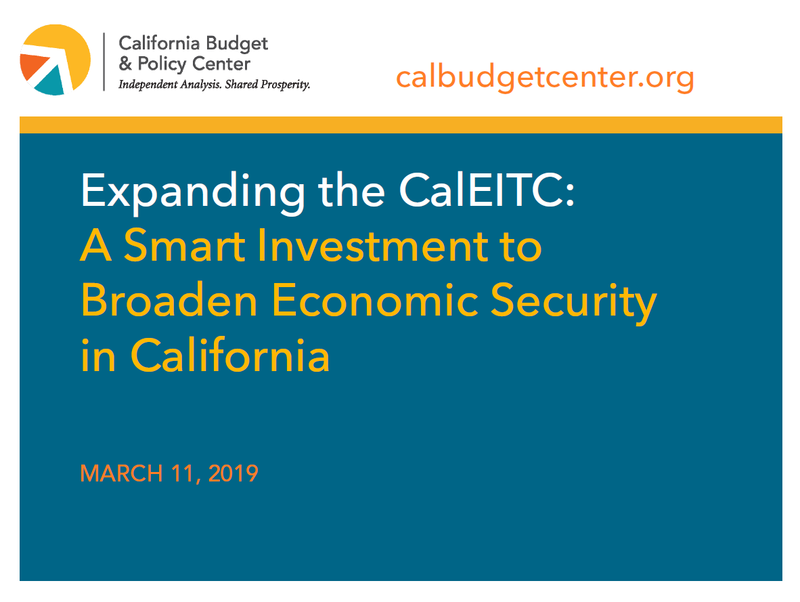 A new California Budget & Policy Center guide, Expanding the CalEITC: A Smart Investment to Broaden Economic Security in California, provides an overview of how EITCs support families, children, and communities; examines key features of the CalEITC; and shows how Governor Gavin Newsom’s 2019-20 budget proposal to significantly expand the credit will impact state residents with low incomes. The guide also highlights several ways that the CalEITC could be further strengthened, including by extending the credit to working immigrants who pay taxes and to unpaid family caregivers.